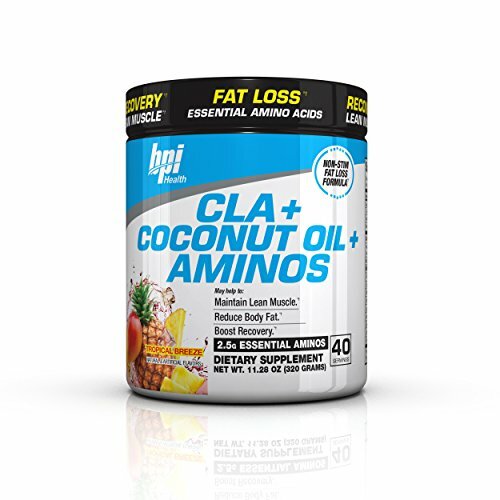 CLA + Coconut Oil + Aminos is a 3-in-1, non-stimulant fat loss formula for those looking to lose fat and build lean muscle. The powerful combination of CLA and coconut oil turns your body into a fat-burning machine that literally burns fat for fuel! These fats also help promote cardiovascular health, endurance and metabolism. Lastly, essential amino acids have been added to help you preserve lean muscle mass and increase recovery so you can continue to perform at your best, day in and day out. Maintain Lean Muscle - Essential Amino Acids (EAAs) help prevent muscle breakdown while you're dieting. Reduce Body Fat - CLA has been shown in numerous studies to help burn stored body fat for fuel, while the fats in coconut oil can help keep you feeling full, even in caloric deficit. Optimize Recovery - Both EAAs and aminos help your body and muscles recover after tough workouts. Boost Performance - EAAs provide extra cellular energy during workouts while the healthy fats in coconut oil can help support performance. Improve Metabolism - Coconut oil provides an instant fuel source for your body and brain, which may help boost metabolism. If you have any questions about this product by BPI Sports, contact us by completing and submitting the form below. If you are looking for a specif part number, please include it with your message.